Last Friday, I made my first attempt to run the 5-mile option of the Labor Day Virtual Run. Before I go into details, but let me just say there was some equip failure that led me to the decision to re-do this race. The Monday before this race was my first time running since the middle of July. I'd hurt my knee and took some time six weeks off to recover be lazy. I ran Mon and Wed and felt pretty good about running 5 miles on Friday. I planned my route using DailyMile, and then decided to plan a different route, so I could run past the building where I had an interview scheduled for the following Monday. Two birds, one stone, and all that. 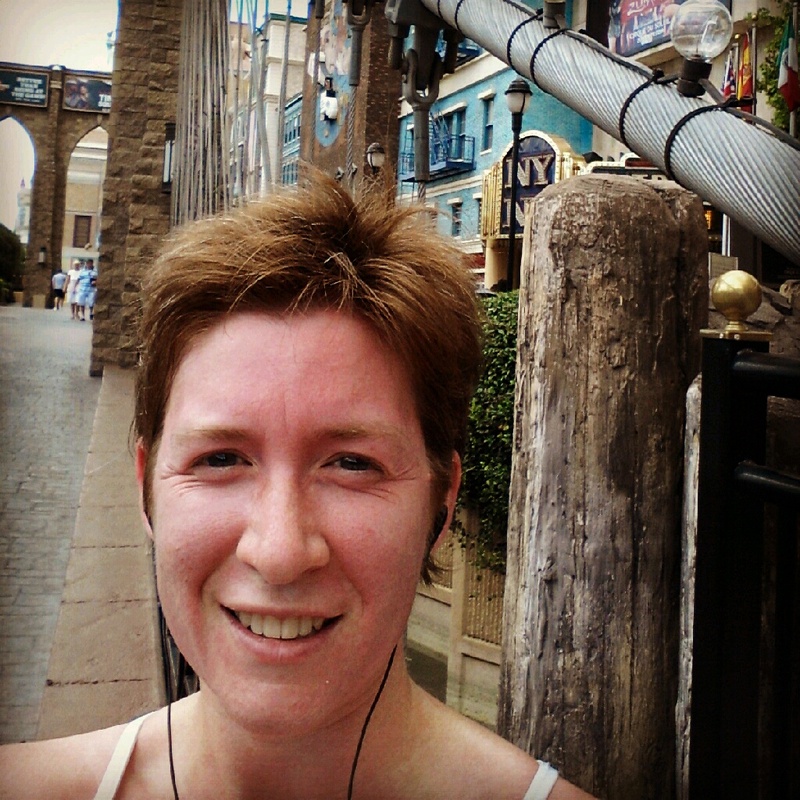 A portion of my run was along the Strip. Running along the Strip is always an interesting experience. I love dodging through the crowds, like I'm a super speedy runner whipping past all the slower runners. Plus it's fun to see all the tourists and the crazy people in outrageous costumes posing for pictures. There was even a guy with a huge lizard that people could pose with! Yikes! The bad thing, of course, especially in the section I was running, is all the damn pedestrian bridges. This meant I had the lucky pleasure of adding a bit of stair-work to my run. I stopped to take a quick pic on the Brooklyn Bridge! Overall, I. felt. great! I had no tightness in my hamstrings! No pain in my knees or shins! The last 1.4 miles, however, were really tough to get through. I blame this on two things really. 1) The abundance of stairs earlier in the run. 2) The fact I didn't start this run until nearly noon, which meant it was HOT! I know I should have headed out much earlier, but, well, I didn't. By the end, I had pretty much convinced myself to do the 10-mile option for the Virtual Run another day, of course as well. I figured if I got an early enough start, I'd be able to beat some of the heat - making the run a breeze do-able. My route planning was off a bit, and I ended my run about a mile from home. My attempt at doing a vlog was fun, but completely worthless as the wind had other ideas. I won't be upset with the wind too much, though, because it sure felt great during the run. So, all-in-all, this was a terrific run! Unfortunately, when I logged it into DailyMile, it had the audacity to think my pace was 12:03min/mi. There was no way this was right! And so, I decided that this 5-miler would have to be revisited before I'd submit my time for the actual virtual run. Have you ever run the Vegas Strip? Would you re-do a Virtual race for a better time? Great job! The stairs along the strip are a killer. No wonder you got tired towards the end. The heat doesn't help either:) I've never run the strip. Might do the Vegas half in December though. Wow- I'm impressed you jumped right back into both 5 and 10 mile distances after that much time off, way to go! Sounds like it was really hot everywhere last weekend. Congrats on pushing through!